Working with leading global property developer Emaar on the stunning new expansion of The Dubai Mall's iconic Fashion Avenue. Located inside The Dubai Mall – the world’s most visited shopping and entertainment destination – the one million square foot Fashion Avenue expansion redefines the meaning of luxury with a five-star experience that is unmatched in the region. 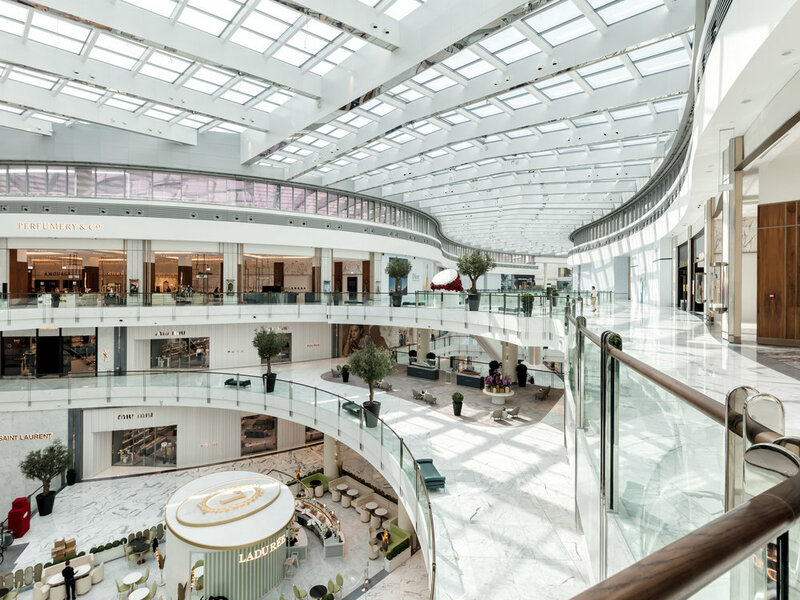 Emaar’s challenge to Kinnersley Kent Design was to rethink the high-end shopping experience, creating an iconic new destination to appeal to the global, luxury fashion customer. The result is a quality of materials and attention to detail unlike anything seen before inside a mall. The scope of work included researching and planning the customer journey and experience, interior architecture, design and detailing, exterior façade and entrance; designing bespoke furniture and lighting; wayfinding design, prototyping, overseeing the implementation and creating the design guidelines for retail tenants. We chose a light and elegant material palette of white, grey-veined Statuario marble for the flooring tiles and balustrade cladding; polished stainless steel as a metallic highlight throughout, and rich carpet and upholstered fabrics which soften the space throughout to increase the luxurious and restful feel. Pops of greenery along the boulevard add to the feeling of natural calm, with large and small trees and planters accentuating the open ‘avenue’ atmosphere. The choice of furniture and accessories was inspired by high-end hospitality, creating an environment that is more hotel than shopping centre. The interior architecture of the ground floor is defined by the double height storefronts of the flagship brands and their elaborate window displays. The white Statuario marble floor tiles are laid in a distinctive diagonal pattern throughout, inset with chrome details to enhance the overall feeling of lightness. Our graphic design team worked with Emaar to develop a proprietary pattern for Fashion Avenue. The motif is a contemporary version of a traditional mashrabiya design, drawing on The Dubai Mall’s Middle Eastern heritage. The VIP bathrooms on the ground floor deserve a visit in their own right. The angular edges of the design contrast with the curves of the main boulevard, with marble tiles cut into a geometric pattern and dark, timber-finned walls. These harder edges are softened by warm diffused lighting, touches of warm timber and soft natural stone. 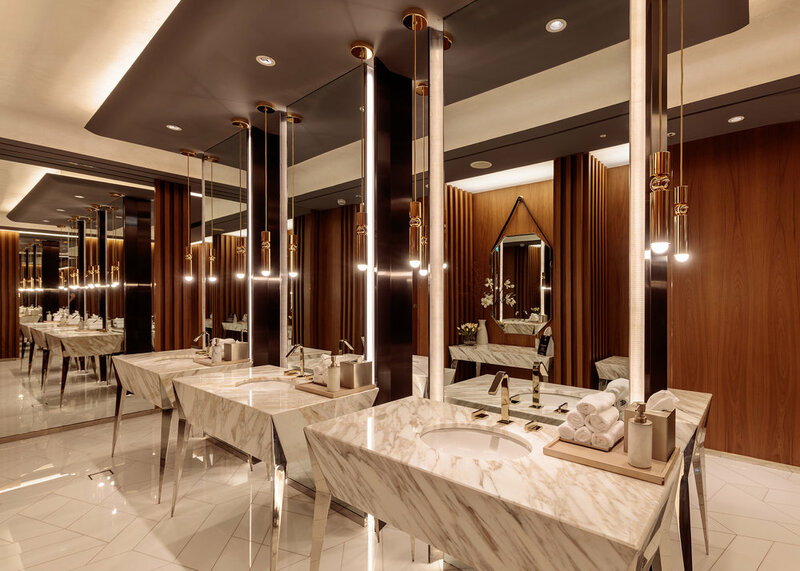 Kinnersley Kent Design created individual vanity stands for each sink, with Calcutta marble tops, slim stainless steel legs and full-length mirrors, lit by gold-drop pendant lights.